Gosses Bluff crater, one of a number of meteor impact craters that can be found across outback Australia. The outback, also known as the Great Australian Desert, is the remote and arid interior (and north) of Australia. The term "outback" is also used colloquially to refer to other locations that are comparatively more remote than "the bush." Although the outback does not officially exist within any governmental frameworks or boundaries, many local government shires use the term to enhance tourist appeal. The desert image of the outback belies the land's natural riches—gold, semi-precious gems, a wealth of grazing animals, and a varied collection of magnificent rock outcroppings juxtaposed to the stark, lunar-like landscape. The hardy souls who populate this rugged terrain are not unlike American pioneers, who had to deal with the issues of climate (Australia is the driest continent), great distances to the cities, and few amenities. More and more, tourists are taking the trek of a lifetime to visit the Australian interior. Less than ten percent of the Australian population lives outside the urban settlements on the coastal fringes. Despite this, the outback and the history of its exploration and settlement provides Australians with a mythical backdrop, and stories of swagmen, squatters, and outlaws such as Ned Kelly are central to the national ethos of the country. The song Waltzing Matilda, is an iconic Australian outback song. With the growth of farms and urban centers along the continent's coastal areas, its native people, the Aborigines, have retreated into the Great Australian Desert, where they sense great spiritual power in such places as Ayers Rock (Uluru). For them it is a sacred place created by humankind's ancient ancestral peoples in the Dreamtime. This magnificent natural wonder has recently become a popular place of pilgrimage to New Age practitioners, some of whom have adopted Dreamtime into their own beliefs. Map showing locations of the Australian deserts. The marginally fertile parts, mainly within the Lake Eyre Basin, are known as rangelands and have been traditionally used for domestic sheep or cattle farming on sheep stations and cattle stations which are leased from the federal government. The outback is also home to the Australian feral camel and dingoes (wild dogs). The Dingo fence was built in an effort to restrict the movement of dingos into agricultural areas toward the south east of the continent. Whereas these south east grassy areas have fairly fertile clay soils, the remainder of the outback has exceedingly infertile paleosols which cannot support fodder nutritious enough for the economic raising of stock. Although the north of Australia has high (if extremely seasonal) and fairly reliable rainfall, giving it almost all the continent's runoff water, the soils there are so poor and eroded (made mainly of ironstone or bauxite) as to make farming impossible even with fertilizers such as super phosphate. Along with agriculture and tourism, mining is one of the main economic activities in this vast and sparsely settled area. 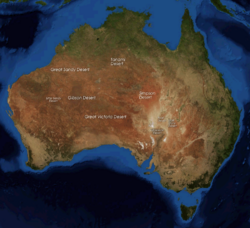 Due to the complete absence of mountain building and glaciation since the Permian (in many areas since the Cambrian) era, the outback is extremely rich in iron, aluminum, manganese and uranium ores. It also contains major deposits of gold, nickel, lead and zinc ores, as well as semi-precious gems. Cooper Pedy, an underground mining town known as the "Opal Capitol of the World"
Ayers Rock (Aboriginal name: Uluru), lying 210 miles southwest of Alice springs, is the second largest monolith on earth, five miles around and almost a thousand feet high. 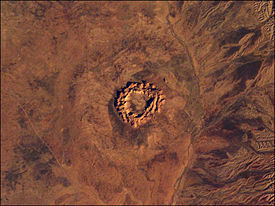 Ayers Rock, also known by its Aboriginal name of Uluru, stands almost 1000 feet high with a circumference of five miles. Organized road travel to the outback is also popular, although some Australian and international tourists travel in their own vehicles. Such a trip, particularly once off the few bitumen roads in the outback, requires considerable advance planning and a suitable vehicle (usually a four wheel drive.) On remote routes considerable supplies and equipment may be required, this can include prearranged caches. Some trips cannot be undertaken safely with a single vehicle instead requiring a convoy approach. Deaths from tourists and locals becoming stranded on outback trips occur, and rescues for the ill-prepared are a regular occurrence. The outback is also criss-crossed by numerous historic tracks, roads, and highways. Flying over western New South Wales. Due to the wide expanses and remoteness of people in the outback, the Royal Flying Doctor Service of Australia was created in 1928 in Cloncurry, Queensland. The aim of the service is to provide medical care, primary and emergency, to people who cannot reach hospitals or general practitioners. Consultations are carried out via radio or telephone and, for serious situations, doctors are flown out to patients. Culturally, many urban Australians have had very generalized terms for the otherwise complex range of environments that exist within the inland and tropical regions of the continent. Regional terminology can be very specific to specific locations in each mainland state. 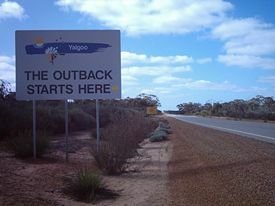 It is colloquially said that 'the outback' is located "beyond the Black Stump." The location of the black stump may be some hypothetical location or may vary depending on local custom and folklore. "The Never-Never" is a term referring to remoter parts of the Australian outback. The outback can also be referred to as "back of beyond," or "back o' Bourke," although these terms are more frequently used when referring to something a long way from anywhere, or a long way away. The well-watered north of the continent is often called the "Top End," and the arid interior, "The Centre." ↑ Wadham, Sir Samuel, Wilson, R. Kent and Wood, Joyce: Land Utilization in Australia, pages 49-50. 3rd edition. Cambridge University Press, 1957. Rau, Margaret. 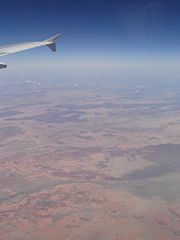 Red Earth, Blue Sky: The Australian Outback. Backinprint.com, 2001. ISBN 978-0595185795. History of "Great Australian Desert"
This page was last modified on 2 April 2008, at 08:00.